The Flying Noodle Dinner and a Movie Club is the perfect gift for her, for him, for them, or for you! It's the next best thing to sharing spaghetti with Sophia Loren! 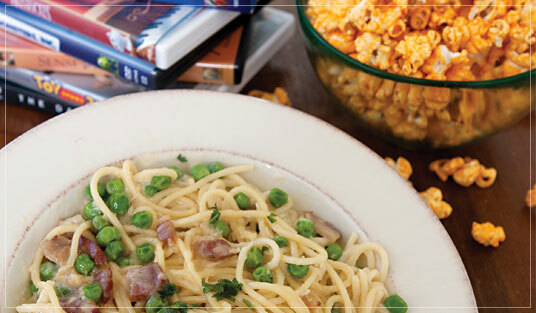 Each month we'll deliver a delicious, Italian themed, gourmet meal complete with a specialty pasta and premium sauce. And for after your meal, we'll also include a Redbox rental code good for a free movie rental and a gourmet popcorn to enjoy with the show! Each monthly shipment will feed 2-4 people (depending on appetites) and included with each delivery is our fun and informative club newsletter with information about our monthly selections, fast and fun recipes and more. Choose from 3, 6 and 12 month clubs or try our Dinner and a Movie of the Season Club with new selections each spring, summer, fall and winter. If you're sending a gift, you can send a gift announcement by U.S Mail or email. You can even print your gift announcement right from your computer. It's the perfect solution for last-minute gift giving! We're proud to deliver some of the most delicious and unique pastas and sauces available anywhere - each brought exclusively to our club members from award-winning chefs and restaurants in Italy and around the world. If someone you know needs the perfect gift to help them relax - the Flying Noodle Dinner and a Movie Club is a gift they'll appreciate month after month. Just like all of our gourmet gift clubs, the Dinner and a Movie Club includes FREE SHIPPING and our 100% Satisfaction Guarantee. They are going to love this gift. We Guarantee it!